There’s probably no bigger name in the poker world than Doyle Brunson’s. He’s a living legend and Hall of Famer, who’s been able to play winning poker successfully for over 50 years. In his career Doyle Brunson has had a tremendous influence on the development of poker. He started his career playing illegal poker games on Exchange Street in Texas with his friend Dwayne Hamilton. Once they got the hang of it, they decided to travel across America, in search of the biggest games. Along the road they met fellow poker legends Amarillo Slim and Sailer Robert, who they became close friends with. They eventually settled in Las Vegas, where Doyle Brunson started to play in the World Series of Poker, which they had help create in 1970. Since then Doyle Brunson has played pretty much every Main Event. 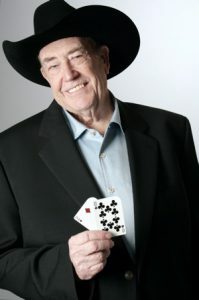 Doyle Brunson was the first person to ever win the World Championship of Poker back to back and has since then won 10 WSOP bracelets and collected nearly $3 million in WSOP cashes. His 10 bracelets have only been matched by poker legend Johny Chan (famous for his appearance in the poker movie Rounders). The only person in the world to hold more WSOP bracelets than Doyle Brunson is Phil Hellmuth, holding the record at 11 bracelets. Besides being the first back to back winner of the world championships, Doyle was also the very first person in the world to officially earn over a million dollars in tournament winnings. He was also the first poker player to ever win a World Series of Poker Main event and a World Poker Tour Event. 1978 was the year that Doyle Brunson changed the world of poker forever when he released his first poker book Super System. It was the very first serious guide on how to play winning poker and has since then become essential reading for anyone, from the homegame hobbyist to the high stakes professionals. His book Super System has been dubbed ‘The Bible of Poker‘ by the poker community worldwide and still sells around 14,000 copies a month. Currently Doyle Brunson can be found playing the biggest games around the world, including the infamous $ 4,000 / $ 8,000 mixed games in ‘Bobby’s Room‘ at the Bellagio. He also makes frequent appearances on several televised poker games like High Stakes Poker, Poker After Dark and the World Poker Tour. You can follow Doyle ‘Texas Dolly‘ Brunson via his twitter feed displayed below or check out his official website. We also provide a review of Doyle's personal blog here.